A Cessna 172 airplane lies on its back after an intentional crash test on Aug. 26, 2015. NASA sent a small airplane plummeting to Earth today (Aug. 26), for safety's sake. 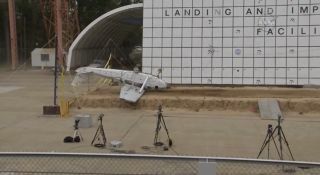 Scientists and engineers at the space agency's Langley Research Center in Virginia dropped a Cessna 172 from a height of 100 feet (30 meters), in a crash test that was captured on video. The plane hit belly first, then flopped over onto its back in the dirt. Two dummies were aboard the 1974 airplane, which was outfitted with a number of cameras and sensors, as well as five emergency locator transmitters (ELTs). ELTs send out signals that help rescue teams find commercial jetliners and other aircraft in the event of a crash. Current ELT models beam those signals up to satellites, which then relay the signals to ground stations, NASA officials said. "ELTs have to work in the extreme circumstances involved in an airplane crash," NASA officials wrote in a statement previewing the crash. "Included in those extreme circumstances are the possibilities of excessive vibration, fire and impact damage. NASA research is designed to find practical ways to improve ELT system performance and robustness, giving rescue workers the best chance of saving lives." Today's crash was the last of three such trials involving different Cessna 172 aircraft, all of which took place at Langley. The first test occurred on July 1 and involved a drop of 80 feet (24 m) onto cement. Then, on July 29, researchers crashed a different plane onto dirt from a height of 100 feet (30 m). The ELT research is funded by the Search and Rescue Mission Office at NASA's Goddard Space Flight Center in Greenbelt, Maryland, agency officials said.